We've always really enjoyed the process of planning a trip: allowing our minds to wander over maps, tracing tiny dotted lines over passes and through valleys, carefully reading the contour lines to see where the steep climbs are going to be, and imagining each campsite as perfect. But we've never taken a hike that turned out to be just as we planned it. And a lot of the time, it's because we choose to make some changes mid-stream. Which is why it really isn't necessary to plan out every campsite and every day's hike on your backpacking trip. Some people seem to want to know where they are going to stop for lunch and stop to sleep every night, as if they need a reservation at a restaurant or a hotel. That's not the way it works in the back country (at least, in most places). You can camp anywhere you want, and there are almost always lots of options. If there are too many people at one lake, you can always go to another. If the mosquitoes are fierce, you can always try going higher...or camping farther away from the water. If the stream is too high you can turn back. And if you don't feel like hiking those last three miles to the lake, you can always just camp along a stream neaby, and start again tomorrow. All you really need is a flat spot for the tent and a source of water within walking distance. Those are not hard to find in the Sierra. We generally plan to hike about 8 miles a day, but have done many days of more than 12 miles, and a few under 5 miles. Sometimes it was because we wanted a better campsite, or wanted to make the next day shorter. Or simply felt great and it seemed like the thing to do. Or we loved what we were seeing and decided to enjoy more of it. And we loved the fact that we were free to do whatever we wanted. One of the great joys of backpacking is that you don't have to be anywhere at any given time. You don't have to complete your full itinerary. You can always climb that mountain or see that waterfall on another trip. Or you can decide to climb over the mountain to see what's on the other side. It's a freedom that hard to find in our daily working lives. And we feel sorry for people who backpack on a tight schedule and an hour by hour itinerary. Seems like they are kinda missing the point of being up in the mountains. 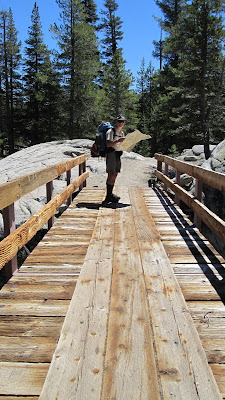 We certainly let them hike their own hike...but that's not why we go backpacking in the Sierra!